It was a fine evening for some fire twirling, a few beers or 3 and some great music…. Despite what many would have you believe, the UK isn’t all bad. As the summer finally arrives, beer gardens are as tempting as they ever were. Turn the telly off, call a friend and go visit one. And When You Feel You’re Near the End…. It hasn’t been because nothing has happened, although, not much has, but rather, along with the latest rumblings from Boomerverse HQ of an imminent relocation once more, designs and plans have been ongoing and taking shape for a new virtual home as well. Adjust any links you may have accordingly, as, in the next week or so, you will find Boomerverse HQ over @ www.theboomerverse.com and the new blog @ www.theboomerverse.com/blog where all outpourings of nonsense, pictures and music will be found. As I read somewhere recently, you need to stake out your own little piece of interweb real estate, something long thought about and subject to much procrastintion. Well, as the grey hairs now appearing are evidence, I’m not getting any younger, and time is a race I doubt I’m going to win at, even if I had a head start. So, time to get a move on…. On a new note, I’ve begun tutoring again, get in touch if you’re struggling with maths, either in the UK or Canada. Not wanting to blow my own trumpet, but I’ve already managed to get a lady through her GCSE equivalency exam within 2 weeks of starting, after she hadn’t done a thing mathematically, for the best part of 20 yrs and even then was so awful, (her words, not mine) she never got entered for the exam. In the garden, the tomato plants are coming on a treat, as are the courgettes, which leads us to the thought that the next place we look for has some more growing space for future harvests. Not to mention chickens…. Other than that, plans are, as always, “fluid”…. A drive and a wander, the order of the day, on a glorious sunny Sunday afternoon…. And on the way home, we took some previously uncharted roads by us, through the countryside. A spur of the moment stop at this old English pub, and I became a very happy man. 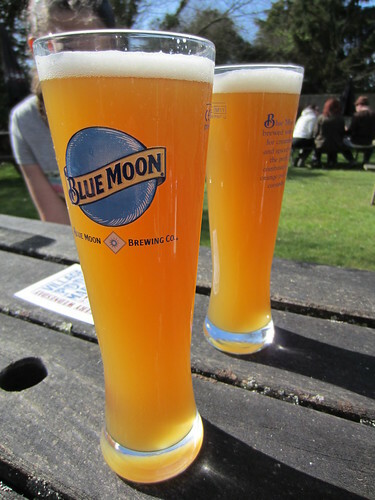 Blue Moon wheat larger…. and on tap! "Mine’s a pint!" 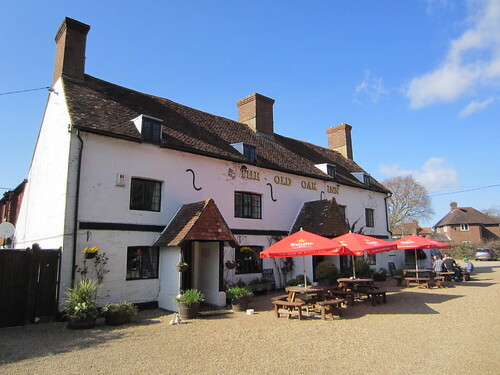 The Old Oak Inn at Arlington, has been there since 1788, when it was originally an armoury for 4 familes, before being turned into a pub at the turn of the 1900’s, says the landlady. If you’re out and about in the Sussex countryside, search it out. What better way to end an afternoon, than with a peaceful hour in the beer garden, whilst the sun is out and there’s blue skies all around…. Just taken a peek and seen the last post was Dec 23rd. And it’s now Feb! Crikey…. We’re still in the UK for now, having set up our HQ Command Centre for a few months, whilst we wait for the next pathway of our fate to present itelf. Other than that, all quiet, as far as I can tell. Nothing too exciting to report. Snow has arrived in the UK. And the boiler, should you have been following the Boomerverse Twitter Feed, has decided to go AWOL. So, that’s handy. Tea, cheese on toast and mutliple layers of clothing, whilst we entomb ourselves in duvets help us stick 2 fingers up to the bloody thing. We foolishly left our snow and winter gear in Canada, so are ill prepared to deal with too much outdoor activity, settling for board games, the radio, reading and Netflix instead. So, on that note, I leave you with Kill It Kid and “Heart Rested With You”. I can’t remember if I’ve alerted readers to this lot, but we’ve got it blaring at the moment…. What next on the classic movie afternoon? “Psycho“? Happy Xmas, One And All…. I didn’t want much for xmas, and then I got a tweet from Nerina Pallot…. …. and discovered she’s only gone and done my favourite xmas tune, ain’t she. Get your lugholes round this….. So, that’ll do for me, thanks. I’ll be playing this long after the batteries run down and the iPads stop working, for years to come, in fact. And on that note, hope everyone has a good xmas. See you in the New Year, I guess…..
“Life Will Find A Way”…. 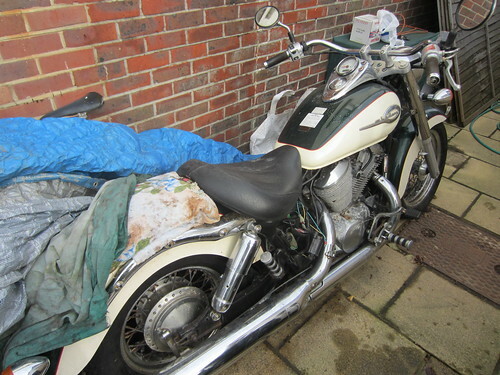 She’s sat, unused, under a tarp for 6 years….. Both my uncle and brother have had a go at waking her from her slumber, but to no avail…. I’ve spent 2 weekends attempting the same, to no response, and as I was about to throw in the towel, and consign her to history and an ending at the scrap heap, as the rainclouds appeared above…. as I attempted one last option, all other reasons for no response seemingly more elusive than ever…. as I undertook the removal and final strip of the carbs, and a rush job to get them back in before I had to leave…..
At last, a sunny afternoon…. On our weekend wander over the South Downs, we came upon a sky full of paragliders as we reached Beachy Head. One of the ladies undertaking an afternoon of this, happy to chat about it, told me after getting her licence (You need a licence to paraglide? Who knew…..) about a year ago, this is one of the first chances she’d had to get out. August apparently had been a wipe out, due to it being too windy. As flier after flier zipped past, before gently drifting upwards, the obvious thought crossed my mind,…. I fancy a go…. Please Don’t Say I’m Moaning, But…. Now, I don’t want to seem like I’m grumpy and that, being back a couple of weeks I’m bashing the UK already, but…. I’ve got 2 issues, both related, which are really starting to tick me off a little. I don’t want to think that having experienced North American customer service, that this is clouding my opinion…. Firstly, 2 weeks ago, we went to look at a house with a view to renting it, in the South East. We called, and set up an appointment, were there at the allotted time and things were looking good. A very nice place, well within budget and all the space we’ve ever wanted. I should have known things weren’t going to pan out, when it turned out to be the owner who was the one to show us around as opposed to the letting agent…. So, having shown an interest in renting the property, we called the agent the next day, with our offer. And that was the last we heard from them. We called back a few days later, to be told our offer had apparently been accepted. Great, we thought, although someone might have let us know, and they were calling back later with a moving in date. But, no call ever came. So a day later I called back, a little irate as to the why I was having to keep chasing them. Apologies and excuses of training errors in the office didn’t exactly put my mind at ease. No word was heard from them over the weekend, (and why would there be? I mean when you hear on the news that the country is in dire straits, you don’t expect people to actually be hustling for work do you……). Yesterday, as the letting agent was "with a client", we were told he’d call back later. Guess what? No call. Which leads me to the second similar issue…. I have tried to register with a tutoring agency, to rustle up some work and bolster the coffers whilst we’re here. However, the woman in charge seems in no hurry to reply to emails at all, when a couple of days after sending her a couple of questions, I’m still waiting for a reply. When I worked for a similar agency in Richmond, the lady running the business, would return my calls, not emails, within the hour, even if it was to say, she was a little busy and would be calling that evening, which, I might point out, keeping her wotd, she did. No emails, no text messages, no Facebook or Twitter update, a call, on the phone….. So, if this is the case, is it really feasible that this new lady is going to be able to find me enough work? I’m doubtful, I’m afraid to say. This is the 21st century for crying out loud. How hard is it to keep clients or customers informed? A 2 min call to say we’re still working on a date for moving in, or a quick email reply to a question? That’s too much to ask is it? In this day and age, when everyone has iPads, "sweet" iPhones ("sweet" iPhone? Another grumble, for another day…..), smartphones and laptops to keep organised and improve their productivity and make their work life so much easier, everyone seems to have forgotten that at some point, you’ve got to stop fart arsing about on your gadgets and do some bloody work, which entails speaking to your clients and prospective customers. And before I get, "if it was so much better in Canada, bugger off back there", I would point out, that when we went to view properties in Richmond Upon Thames, the agents were only to please to fit me in that day and were, and have since, been keeping me informed on a daily basis. If my experience is anything to go on, it’s not hard to see why London get’s all the jobs….. I Think I See The Problem…. Should you already know this, do bear with me, I’ve only recently returned to the UK for a visit….. Libraries, as regular readers may be aware, are a favourite haunt for me, so on arriving, it was one of the first places I thought I’d investigate and see how it compares to the Canadian counterpart. One thing different, is the charging for rental of CD’s and DVD’s. I can accept the 90p charge per CD, it seems fair, but the 60p/80p reservation fee seems steep and to be blunt, a little stupid. Make the rental a round quid, for goodness sake. If I want to support my local library and make use of it, by renting a lot of items, it isn’t long before the cost outweighs the benefit of using the place. The DVD’s make this point, even more clearly. As a case in point, I thought I’d compare something I saw on Amazon, the entire box set of all 8 series, including the made for TV movie, of "24"…..
Let’s assume, on the positive side, that in each "sleeve" at the Eastbourne library, it contains 2 discs, each containing 4 episodes. That means 3 "sleeves" per series, 8 series, means 24 sleeves. Renting, from the library, 24 sleeves @ 3 quid a sleeve, is 72 quid…..
…. if it’s 1 disc per sleeve, which is likely, and the library service in the UK is an utter rip off. And this doesn’t even include the "fees" you get charged of a quid, per item, to make a reservation….. so, you can add another 24 quid to that 72. So, a hundred pounds. To rent a TV show series, that I can buy brand new for 40, from Amazon. I think I see the problem here….. Which probably explains why the DVD rack was full, and the majority of people where in there using the computers. In Canada, both the rental of every disc, along with the reservation of each disc, CD or book, is free. Anyone use the library for DVD’s and CD’s? Or know of anyone who does? How popular is the rental of DVD’s and CD’s from UK libraries? I’d love to know, as right now, I see no point them at all. 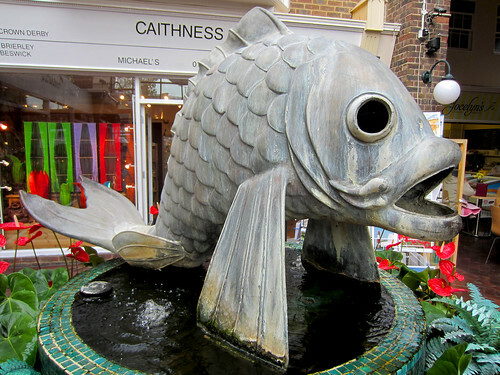 “Caught” in the Enterprise Shopping Centre in Eastbourne, which has a number of nice little, independent shops, from crafts and health, to a fishmongers and a butchers. If you’re in the town, take the trouble to wander along and discover it yourself. You’ll find it up behind the railway station.